On January 16, 2014, the Marin Hazardous and Solid Waste Management Joint Powers Authority (JPA) approved the Marin County Single-Use Bag Ordinance in an effort to reduce the environmental impact of single-use disposable bags. Each city and town in Marin County will adopt the ordinance independently. For more information about the Single-Use Bag Ordinance in your neighborhood, please check out the In Your Town or Information for Retailers sections. 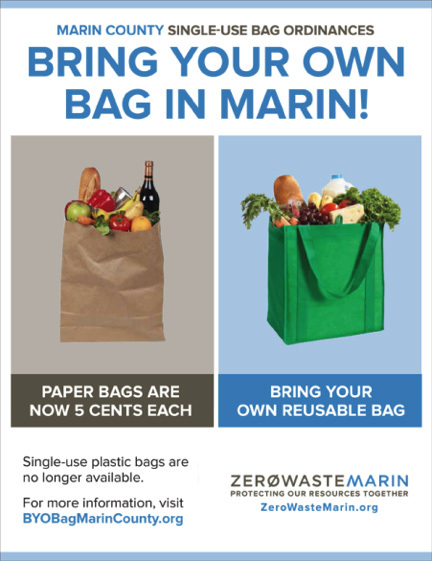 In order to encourage sustainable living in our communities, we are urging residents to Bring Your Own Bag when you go shopping in Marin County. Recyclable paper bags will still be available for a small fee. Each city and town of Marin County holds the authority to adopt a Single-Use Bag Ordinance. 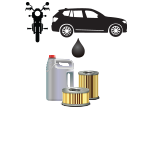 Municipalities are at different phases of adopting and enforcing their ordinances. Currently, the ordinance is in effect in the locations listed below. Please click on the link for details, and check back to see the status of your city or town’s ordinance. Poster content is available in digital format for printing. Print out this poster to inform your customers of the Single-Use Bag Ordinance in your city or town, and to remind them to bring their own bag. Content can be provided upon request by clicking “Contact Us” and submitting your request. Each city or town ordinance requires different fee’s for paper bags. Please review the respective ordinance language for your city or town for the correct fee.